Morgan can be identified as an individual using a number of features. These include the pigmentation patterns that make her saddle patches, her eye patches and the lines between any white and black areas. Additionally, her dorsal fin shape is unique to her. 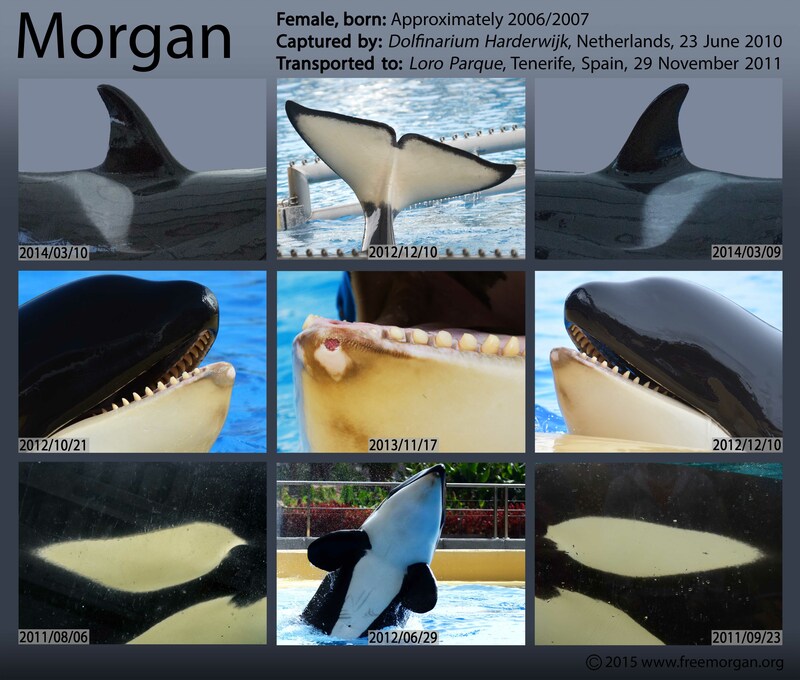 We have provided an Identification (ID) chart of pictures of Morgan, which we have taken when monitoring her situation in captivity. Each image on the ID Chart has a date in the corner, showing when we took the photograph. Morgan’s ID chart. You can click on it to see a much higher resolution. Remember, we ask that you don’t buy a ticket to places that keep cetaceans (whales, dolphins and porpoises) in captivity. There is a continually growing body of evidence that shows cetaceans do not thrive but rather suffer and if you buy a ticket you are helping to support that. However, if you can get a free ticket and would like to help, we ask that you clearly document everything that you see. This is not only a matter of videoing and photographing the shows, but what happens before, between and after. Please document each and every individual – take photos of their teeth (left and right, but also upper teeth if you can), eyes, dorsal fin (left and right) and any part of their body that shows scars. Video their behaviour (even if they appear to be doing ‘nothing’ – this is evidence in itself, showing that the animals are not behaving normally – in the wild cetaceans are nearly always on the move). Document information signs, show signs, state of the facilities (rusty gates etc) and what food, ice, gelatine, etc that the animals are given. Video and photograph ‘husbandry’ events such as ultrasounds, teeth flushing, pee collecting. And please document any acts of aggression towards the trainers and the other animals.